i love this reciepe and food! 1 14oz box of Macoroni and cheese. 1/2 cup shredded Cheddar and Monterey Jack cheese. Preheat oven. Spray a pie plate with cooking spray. Cook the Macoroni in boiling water until tender. Add the broccoli for the last 2 minutes. 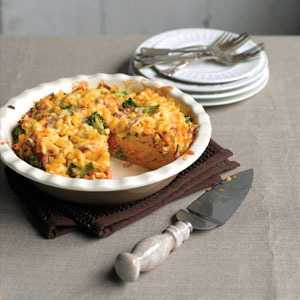 Beat the eggs in a bowl and stir in the cheese sauce and the ham if using blending well. Pour mixture over drained pasta and combine. Spoon this in the pie plate and sprinkle with cheese.